As the seventh largest community in Rhode Island, Coventry is a suburban town that is reported as 52 percent safer than most cities in the United States. However, that does not take away from the fact that of all the crimes committed in Coventry, the majority of these crimes are property crimes. This means it’s of utmost importance to secure your home and auto using the convenient services of Jon’s Locks. Today, we are always looking for the best deal. As understandable as it is, you also want to thoroughly research who comes to your home as well as the service that is provided. At Jon’s Locks we are proud to be a professional locksmith service company. Our locksmiths are each certified, insured, and registered locksmiths. You may want the instant gratification of access to your home or car or a quick car key replacement. However, stop and think about your privacy and future security of your home, car, or business. This is why each of our locksmiths are certified, insured, and registered. You can be sure to trust our home and auto locksmiths. In addition to trusting the security of your family to a locksmith, you want to ensure the services provided are insured should any damage occurs. We strive to give each customer the service they deserve. This is why we are available for you to come to us or we will come service you. Our real walk-in location is conveniently located at 2291 W Shore Rd., Warwick, RI, 02889, near Palmer Avenue and Samuel Gorton Avenue. You can call ahead to come in or contact us to schedule an appointment. Our mobile locksmith services are available to you as well. We are there when you need us. 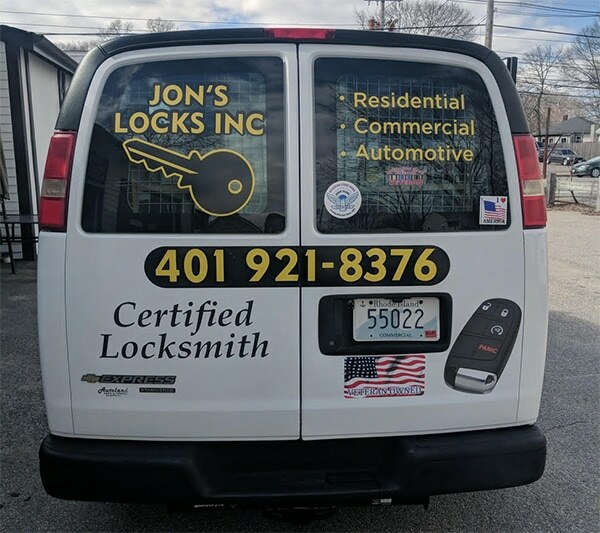 Need a locksmith Coventry, RI? Jon’s Locks is here for when you need us the most. No matter if it is a residential, business, or auto lockout, we have the tools readily available to help you. Give us a call today for a quote or service appointment.